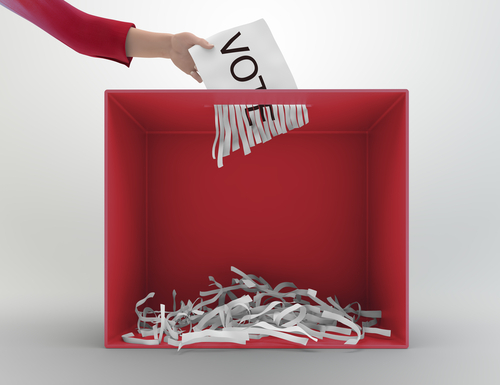 Judicial Watch has filed a letter of intent that reflects a very serious problem in California voting. Eleven California counties posted more votes for Hillary than exists in registered voting population. We are looking at massive voter fraud in California that could seriously rock the nation when we consider that if we eliminate California, Trump won the majority of the vote everywhere else. This is not about supporting Trump. That is long since a non-issue. This is about going forward. Can any election be trusted any more? If we can buy goods online in a secure manner, we can also vote on line in the same secure manner. Even those who do not have a computer posses usually a smart phone which can also be used to vote. For those people who do not have either, then they can go to the public library or town hall to vote as people do today so nobody is left behind. Voting online will eliminate voter fraud for you cannot vote without a Social Security card. Plain and simple. I appreciate all the people who write in and ask me to run for President of something. Let me make one point very clear. They would assassinate me before my hand hit the Bible. This is why Trump is besieged on every possible front regardless of his comments. You cannot fix the system and end corruption from within. Yes I would like to think some knight with shining armor riding a white horse will enter and save the day. That’s for stories you tell your children to give them hope that the world is really fair. Historically, change comes only when the people rise up. We are not there yet. But it is coming.